This extraordinary artisan Balsamico is produced and bottled on a single estate in the Modena region of Italy. Made exclusively from hand-harvested Trebbiano grapes, the "must" is aged for 10 years under careful, expert supervision in heirloom wood casks made of oak, juniper, cherry, mulberry, and chestnut. Lucini Italia adds no sugar, color or grape concentrate for a natural aging process that ensures balanced, fully rounded flavor and aroma with layers of complexity. 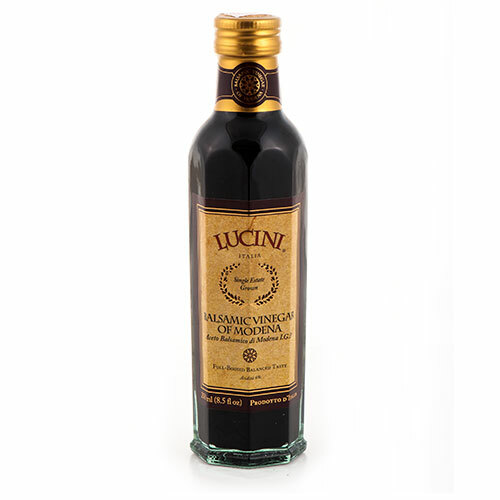 Lucini Italia Vinegar starts from grapes that are grown, harvested, aged and bottled on a single estate located in Modena, Italy and are all guaranteed lead free.